Thanks to Kitty for the Header! Every Wednesday night, writerly inclined DayKnights hang out to share successes and struggles and to generally enjoy one another’s company. It’s a great reprieve from the pressure of trying to get writing projects started/finished. During the hangout, we discuss anything and everything that comes to mind. We discuss our favorite movies, books, TV shows, and video games, old and new. We help each other untangle plot knots and devise clever ways to kill characters or to make our villains more believable, and more villainous. How does the hangout work? We all hop into a Google+ Hangout together. There have been very rare occasions in which the 10 person limit was a problem, but we can always split into smaller groups if need be! Then, we just chat away until we all get too tired to stay up! How does one join the hangout? Follow the below steps (in the spoiler) to make sure you get the invitation to the weekly hangout. The tl;dr version: Add Steppelively and nomikkh on G+ and be logged in on Wednesday nights. Join when you get the notification! If you are adamantly anti-G+, then feel free to find an awesome, free alternative where we can all video chat together! Install the Google Hangout App on whatever device you are using. If you do not have it installed when you try to join the Hangout, Google will prompt you to install it. 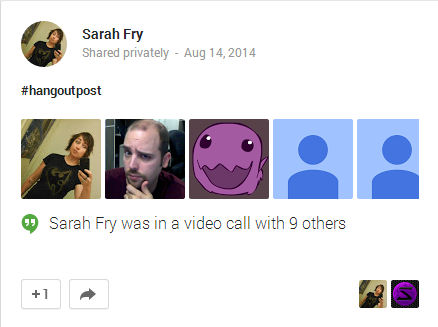 It would also be a good idea to add a few of the other DayKnights in the Hangout (especially Sarah nomikkh Fry), in case Stephanie cannot start the Hangout. On Wednesday nights, be logged into G+ and have your Home page open. 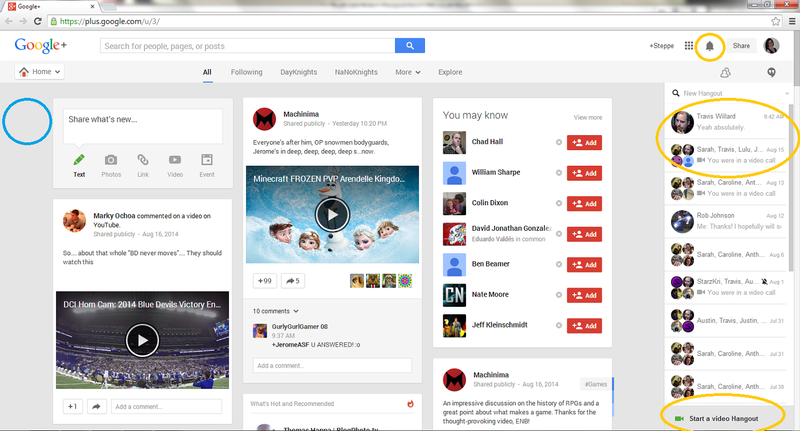 Here’s a link to what the G+ Home page looks like. This screen is your friend. You will receive a notification (barring any G+ glitches, which sometimes happen) letting you know the Hangout is live. Here’s a link showing the places you’ll find the notification. You should see a red notification symbol on the bell in the top right yellow circle. The Hangout chat will appear along the side bar where the middle yellow circle is, and in the bottom yellow circle, the green bar will become a red bar that says a Hangout is live. The blue circle on the left is where a “refresh” button will appear when the hangout goes live, showing the hangout post on the feed on your home page. Here’s a link to a recent post for the DayKnight Time Hangout. When the Hangout’s live, there will be a big friendly green button that says to join the call! We’ll add to this as questions arise. Q: When does all this happen? The hangout itself starts at 7:30pm PT on Wednesday nights and goes until everyone is too tired to stay in the chat! Q: Wait, but the Day Daily starts at 7:00pm PT!! As a tradition held over from the National Novel Writing Month days, yes the hangout itself starts while the amazing Day is still live. Come hang out and watch Day with us! It's like having your room filled with friends who are all watching Day together! Q: What if I’ve never written anything, but I’m interested in writing. Can I join? A: Absolutely! It’s a supportive writing environment. We come from very different places in our writing and join together to encourage one another wherever we may be. Q: Do I have to share my writing? A: Not if you don’t want to. A couple of the DayKnights have pieces they are working on that are ready for fresh eyes, but most of us are still cranking away at our drafts. Of course, if you want to share, please do! Q: I’ve done everything in the above list to join the hangout, but I still can’t seem to find it! Help! Did I do something wrong? A: Probably not. G+ is sometimes glitchy. If you are having issues finding us, message Stephanie directly on G+ (go to her profile and there should be a button to message her), and she’ll get you added. You can also tweet at her (@smlsullivan), and she promises to keep an eye on Twitter for any such messages. Q: I live in (country far far away from Day), and would love to participate in something like this, but it's way too late/early/in the middle of my work day. Can we do it at a better time? The Hangout has been growing and changing since its inception in November of 2013. We would love to do more things that are accessible to DayKnights around the world. 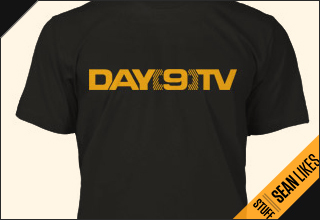 Send me an email (stephanie@day9.tv) and we can talk about ideas to make it easier for our international brothers and sisters to join us! Q: My question’s not here. What do I do? A: Post your question as a response below and we’ll add it to the FAQ! National Novel Writing Month: Planning! There has been some talk about wanting to have Sean do another "European week". And I thought, why not make a petition on it? So here's a petition about getting another European time zone week! Support the cause!